New Prism Designs 55L Thursday outfit is YVANA. Super cute casual outfit with an oversize belted blouse, jeans leggings and boots. Blouse has a HUD with 5 pretty colors.. Come try a free demo. Yavana is available for 55L for a very short time. PRISM ~ Another April Group Gift from Jezzixa Cazalet - All the Bunny Pieces! 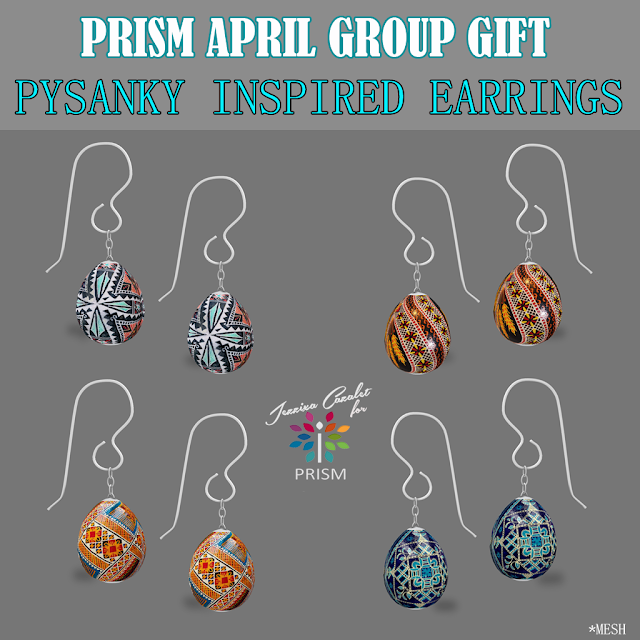 Another NEW Prism Designs April 2019 Group Gift! Bunny parts and pieces for ladies and gentlemen. Two styles, one with bows and one set is plain. Includes flexi whiskers, nose, teeth, ears and a tail. Free for Prism Hauties! Group join is free! Happy Easter! Prism Group Join is FREE! PRISM ~ New Exclusive Release at the Designer Circle by Jezzixa Cazalet "VALARIE"
Prism new release at the Designer Circle by Jezzixa Cazalet. "VALARIE" springtime casual dresses. SIX rich colors are available with sizes for Maitreya, Belleza, Slink, eBODY. Tonic, TMP and Fitmesh and Classic included. Valarie is being offered for a special low introductory price at this event. April 14 - April 26. Stop by and pick up a demo. 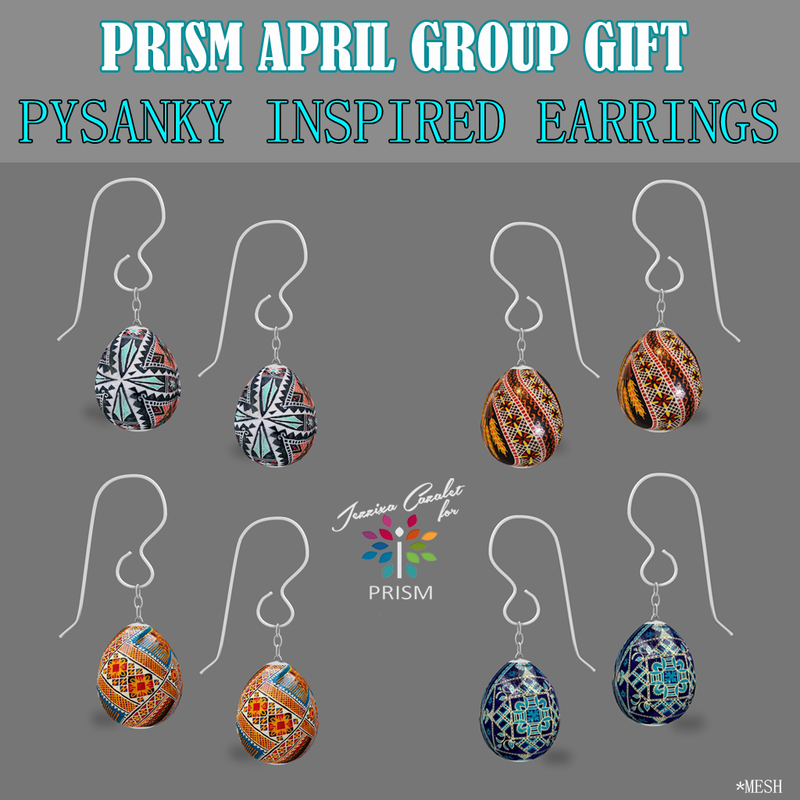 NEW Prism Designs April 2019 Group Gift! Pretty, dangle, pysanky (decorated Easter eggs) inspired earrings in sterling silver. Four pretty designs are included. Free for Prism Hauties! Group join is free! New Prism Designs 55L Thursday outfit is RAISA. The lounge outfit has a chiffon delicate print top, leggings and a white lace bra. Included is a four fabric HUD for the sheer top and one for the leggings. Come try a free demo. Raisa is available for 55L for a very short time. Prism new release at the Designer Circle by Jezzixa Cazalet. "GWENN" in jewel tones. Seven rich colors are available with sizes for Maitreya, Belleza, Slink, eBODY. Tonic, TMP and Fitmesh and Classic included. Gwenn is being offered for a special introductory price at this event. March 31 - April 12. Stop by and pick up a demo. PRISM ~ DAWN Springtime Dresses have Mesh Body Update! I just updated DAWN, a favorite dress of mine, with a variety of mesh body versions. Pretty off shoulder casual mini dress is available in 6 spring time prints. Come try a demo. PRISM DESIGNS since 2008 offers quality, on-trend ladies and mens fashions.